The Crossroads Reading Series will be held at 7 p.m. on Thursday, April 16, at IU East’s Room 912, located at 912 E. Main Street in Richmond. This event is free and open to the public. The Crossroads Reading Series is an annual collaborative showcase, featuring creative writing from students at IU East and Earlham College. Students from each campus come together to present and share their fiction, poetry, and creative non-fiction and to foster a spirit of collaboration and engagement between the two campuses. This year, students from Richmond High School will join and participate in the Crossroads Reading Series. The Senior Capstone Art Exhibition, which includes works by eight Indiana University East seniors, will be on display in the Room 912 Gallery, located at 912 E. Main Street in Richmond. An opening reception is scheduled from 5-7 p.m. Friday, April 17, at Room 912. The exhibition is on display April 17–May 22. It is free and open to the public. IU East’s Fine Arts Program requires students to complete a Senior Capstone Project to earn a Bachelor of Arts in Fine Arts. Each student must create an original body of work in their area of concentration during their senior year and display their creations in a final exhibition. This year’s exhibit includes paintings, photographs, drawings, ceramics and miniature figurines. Indiana University East junior B.S.N. nursing students will deliver a presentation about their trip to Roaring Creek, Belize, at 6 p.m. on Monday, April 27, in Tom Raper Hall Room 124. The nursing students traveled to Belize during spring break, March 16-20, to complete clinical hours for their practicum course on Alteration in Neuro-Psych. During the presentations, students will discuss their travel, clinical work, and learning experiences. 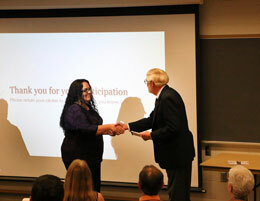 Lori Stephens receives an award for her poster from George Blakey, professor emeritus, during Student Research Day held April 3. Nine Indiana University East students received awards during the Student Research Day held April 3. Student Research Day recognizes the research, scholarly and creative work of IU East student scholars. The day included poster and oral presentations, a three-minute thesis competition and an awards ceremony.